Talk radio personality Jim Quinn of "The War Room with Quinn and Rose" addresses the faithful at the Indiana Armstrong Patriots tea party rally in Kittanning, Pennsylvania. 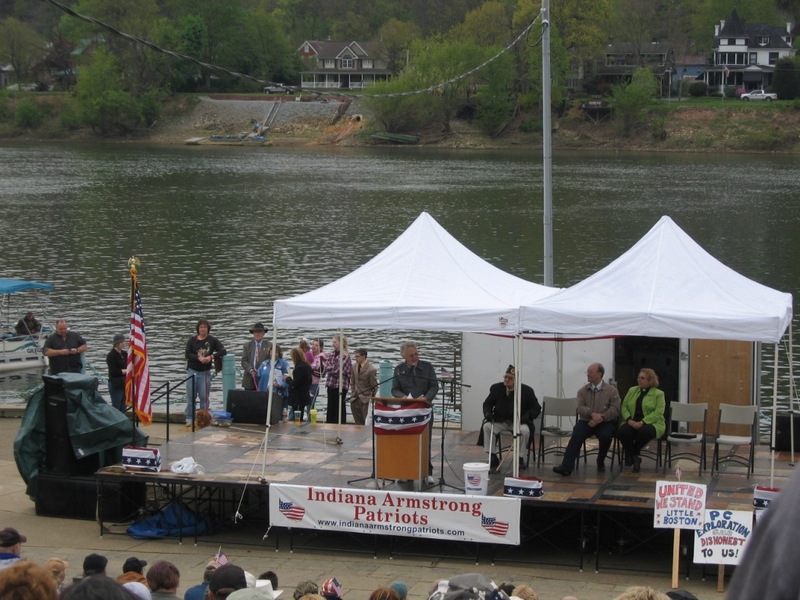 The following speech was delivered at an Indiana Armstrong Patriots Tea Party Rally at the John P. Murtha Amphitheater in Kittanning, Pennsylvania April 24, 2010. I’m here today to elaborate on the Democrat Party’s management of America’s decline, and to tell you that the fate of this nation is in your hands because the founding Spirit of America has awakened you to resist the tyranny at her doorstep. This is why the Tea Party movement identifies with America’s first revolt against tyranny, the Boston Tea Party, and why many in the movement dress in colonial garb and brandish the country’s founding symbols such as the “Don’t Tread on Me” Gadsden flag and Benjamin Franklin’s snake cut into eight parts depicting the danger of disunity. As Franklin’s drawing was a call for patriots to unite against the tyranny of the British monarchy, to those same ends I call upon the tea party patriots today to set aside political differences and unite against the tyranny of the progressive oligarchy. America’s Founders had the wisdom to recognize their common enemy, to put aside their political differences, and to hang together to keep from hanging separately. Today, however, too many tea party patriots don’t recognize the progressive enemy and far too many are blinded by their pet political issues to see the overarching socialism that is destroying this country. For the many who have not yet figured it out, the “change” that Brother O promised during his campaign involves the dissolution of the Republic and the imposition of a socialist state, and from the outset of his coronation in January 2009, his Bread and Circuses administration and the Democrat Party have been working feverishly to that end. I’ve heard radio talk show hosts and so-called conservative leaders who identify with the Tea Party movement blame corrupt politicians and America’s two-party system for her demise, but if truth be told, the blame lies squarely at the feet of the Democrat Party and the piper who calls the tune, George Soros—the party’s billionaire benefactor and creator of the Shadow Party, which is a nationwide network of more than 60 unions, 527 groups, and think tanks designed to ensure Democrat dominance in the electoral process and to achieve one-party rule in the United States. The background of the world’s thirty-eighth richest man is replete with effecting political “change.” He helped finance the 1989 “Velvet Revolution” that brought Vaclav Havel (Vass lass Have vule) to power in the Czech Republic. He also helped to engineer coups in Slovakia, Croatia, Georgia, and Yugoslavia. Before effecting political change in a country, Soros first establishes a shadow government, which is a fully formed government-in-exile, ready to assume power at the opportune moment. The Shadow Party control center that he created inside the Democrat Party is patterned after the shadow governments that he created in other countries before instigating a coup. To bring change to America’s political system, Soros had to limit the ability of the political parties to raise money. So in 2002, he engineered campaign finance reform complete with a loophole for private 527 organizations such as MoveOn.org that could collect soft money. Once the McCain-Feingold campaign finance laws were established, Soros assembled a coalition of political strategists, activists, and major Democrat donors at his Southampton beach house in Long Island, New York, in 2003, and there he built the Shadow Party to circumvent those very laws that he engineered. To test the political waters, Soros dumped more than $300 million in Democrat coffers, and created Americans Coming Together or (ACT), a group made up of big government and teacher unions to coordinate media ads and carry out the ground war. ACT gathered 100,000 campaign workers and collected large amounts of money to knock on doors and get people to the polls. When his candidate John Kerry lost the presidency in 2004, Soros assessed what went wrong then assembled 70 plutocrats in Scottsdale, Arizona, to form the Phoenix Group in the spring of 2005, and there he laid out a five-year plan to create a network of think tanks, media outlets, and training centers to promote his progressive-socialist-Marxist politics. The Shadow Party is the center of power of the Democrat Party; certainly no Democrat can be elected without tapping into its constellation of organizations. Actually, the Shadow Party is the Democrat Party. It works behind the scenes pushing a radical socialist agenda and few Democratic voters know it even exists. In December 2004, the Executive Director for MoveOn.org declared the Democratic Party George Soros’s property: “Now it’s our Party. We bought it, we own it …” And in 2006, Joe Lieberman discovered the accuracy of that statement when the three-term incumbent U.S. senator and former vice presidential nominee of the Democrat Party was ousted from the Party by an unknown in the Democratic primaries. Soros views America’s free enterprise system as the greatest obstacle to world justice and stability, so he’s on an ideological mission. He’s assembled a coalition of billionaires, giant unions, street radicals, and seasoned political operatives, never before seen in American politics, to subordinate America’s interests to global interests; her sovereignty to global government; her law to global courts; her wealth to global taxation; and her productivity to global redistribution schemes. For Soros to realize his mission, the Democrat Party will need to remain in power through the November Midterm election. Last September Vice President Joe Biden said that if the Republicans take back control of the House, it’s “the end of the road for what Barack and I are trying to do,” in other words, doomsday for their socialist agenda. He went on to say that the November election is the “one shot” Republicans have at stopping the Democrat agenda, and if they don’t “the dam will break and a new era of bipartisanship will begin.” Biden’s “era of bipartisanship” will end America’s experiment in representative democracy and usher in the dawn of a new age of progressive socialist governance and dictatorial one-party rule. In 1932, the German people were afforded a rare opportunity to vote the Nazi Party from power. They had the chance to save their republic from a socialist dictatorship but chose instead to remain divided and cling to their petty political differences. Because the majority of the German people wouldn’t unite to defeat their greater enemy, the Nazis stayed in power with 42 percent support and every German shared in the guilt of Hitlerism. Unlike the German majority in ’32, we have the luxury of hindsight. We know that a government that’s big enough to supply our every need is also big enough to take away everything that we have. Friedrich Hayek and Ronald Reagan warned us that big government destroys individual liberty, personal freedom, free enterprise, and the rule of law. And socialism is big government squared; it is a profoundly un-American system that provides a ruling oligarchy with the power to control all aspects of human life from cradle to grave. Winston Churchill said: “Socialism is a philosophy of failure, the creed of ignorance, and the gospel of envy, its inherent virtue is the equal sharing of misery.” Simply put, socialism, also known as progressivism or leftism or statism, is America’s natural enemy. The socialist beast that fully controls two of the three branches of America’s government is analogous to the nine-headed Lernaean (ler knee ian) Hydra in Greek mythology. As the story goes, each time Heracles would destroy one of the monster’s heads, two more would spring up in its place. He discovered that the only way to kill the beast was to find and sever its one immortal head. Heracles’ discovery regarding the vulnerability of the Hydra also applies to the socialist monster governing America. As Andrew Brietbart’s investigative reporters proved by exposing the corruption at ACORN, it is possible to take down and neutralize the effects of a Soros-funded organization. However, like the heads of the Hydra, when one is destroyed more will emerge to take its place, and in the case of ACORN it will be more groups bearing different names and acronyms. Metaphorically speaking, the only way to destroy America’s governing monster is to sever its immortal head, and the Democrat Party is that immortal head. And whether we like it or not, the Republican Party is the only weapon in our arsenal that can remove the socialist monster from power. Supporting Libertarian, Green, or even lesser third parties will only diminish the power of the electorate and ensure Democrat rule and a socialist dictatorship. What happened when George W. Bush and the Republicans tried to push through the Dubai Ports deal? The people rose up in anger, flooded the White House and the Congress with letters, phone calls, faxes, and e-mails, and Bush withdrew deal. What happened when Bush and the Republicans tried to push through the controversial Supreme Court nominee, Harriet Myers? Again, the people rose up in anger, flooded the White House and the Congress with letters etc, Bush withdrew the nomination. And what happened when Bush and the Republicans tried to push through the McCain-Kennedy Immigration Reform Bill? Once again, the people rose up in anger flooded the White House and the Congress with letters etc, and the amnesty bill was abandoned. What happened when Brother O and the Democrats tried to pass the American Recovery and Reinvestment Act of 2009, that massive Keynesian waste product commonly referred to as the Stimulus Bill? The people rose up in anger, flooded the White House and the Congress with letters, phone calls, faxes, and e-mails, only this time Congress passed the bill and Brother O signed it into law. What happened when Brother O and the Democrats tried to push through controversial Supreme Court nominee Sonia Sotomayor? Again, the people rose up in anger, flooded the White House and the Congress with letters etc, but this time the nomination was confirmed by the United States Senate and she’s an Associate Justice of U.S. Supreme Court. And what happened when Brother O and the Democrats tried to push through the health care reform bill, known as ObamaCare? Once again, the people rose up in anger, flooded the White House and the Congress with letters etc, only this time Congress passed the bill and Brother O signed it into law. Which political party has tried to discredit the tea parties? Which political party has been slandering tea party activists? Which political party has called tea party protesters Astroturf and has falsely accused them in the national media of shouting racial invectives and of spitting on congressmen? And which political party stereotypes tea party activists as racists, homophobes, and bigots? Now if memory serves me well, didn’t the Congressman, for whom this amphitheater is named, stereotype his very own constituents as racist rednecks over the national media in 2008? What’s more, I can name several libertarian and conservative Republicans who champion those very principles the tea party movement supports: free markets, fiscal responsibility, limited government, the original intent of the Constitution, and the sanctity of the rule of law, but I can’t name even one congressional Democrat who values those principles. Can you? First, they will grant amnesty to illegal immigrants and speed up their citizenship status to add millions of new Democrat voters. Next, they will use survey sampling instead of an actual head count for the census to increase the population figures for northeastern cities so their states will get more congressmen and more electoral votes to offset the population shift of the sunbelt states. Then they will eliminate the secret ballot in union elections to add more unions, which means more union members to vote Democrat. Finally, they will silence dissent over the Internet through Net neutrality regulations and over talk radio by establishing community advisory boards consisting of local political activists who will monitor radio programming for the FCC and rate whether the content meets community needs. The FCC will levy hefty fines and revoke licenses for low ratings. Under the guise of progress and compassion, socialism concentrates all the wealth in the hands of an oligarchy in the name of social justice; it reduces people to misery in the name of sharing resources and to ignorance in the name of science; it creates inequality in the name of equality and constructs a network of concentration camps in the defense of liberty. With disaster looming, are you going to wait until freedom is gone before you understand what freedom means? Are you going to wait until you have no future before you discover the purpose of life? It’s time to decide whether you will be free men or slaves.